Engineers at Sandia National Laboratories have built new fractal-like, concentrating solar power receivers for small to medium-scale use that are up to 20% more effective at absorbing sunlight than existing technology. The receivers were designed and analyzed as part of a Laboratory Directed Research and Development project and are also being used in Sandia’s work for the Solar Energy Research Institute for India and the United States, or SERIIUS. SERIIUS is a five-year project co-led by the Indian Institute of Science and the National Renewable Energy Laboratory, sponsored by the U.S. Department of Energy and the government of India, which aims to develop and enhance cost effective solar technology for both countries by addressing the challenges and barriers of each market. Sandia has led the group’s research in concentrating solar power, concentrating on scalable systems. While most concentrating solar power facilities across the world are large, Sandia Engineer Cliff Ho says India is interested in building 1 megawatt or smaller facilities that could provide the suitable amount of power for a small community or village. Enhancing the efficiency of these smaller receiver designs is a major step toward making that goal a reality. 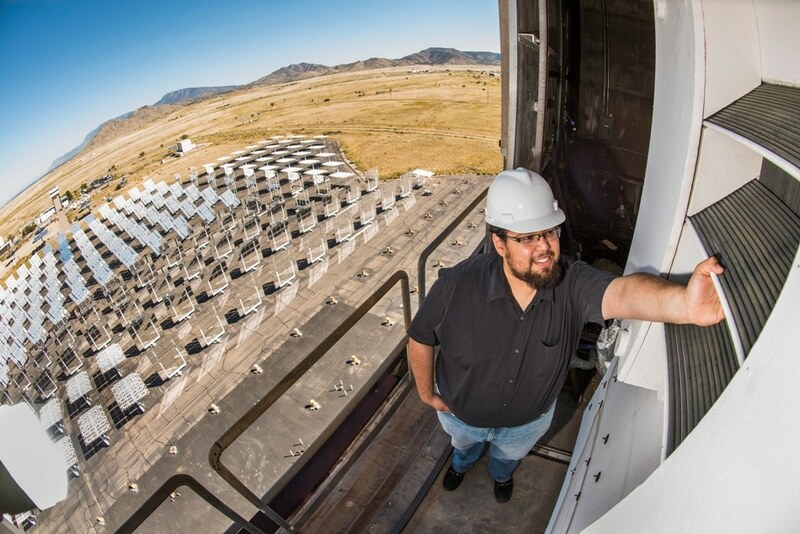 Sandia Engineers designed and examined the new receivers at the National Solar Thermal Testing Facility, studying their ability to endure high temperatures and pressures while absorbing sunlight as heat that can be stored or moved to a power cycle to produce electricity. At Sandia’s facility, rows of mirror-like heliostats are directed at a tall building with a main receiver installed at the top. The heliostats reflect and concentrate the sunlight on the receiver, which absorbs the sunlight’s heat and conveys it to gas flowing through the receiver’s paneling. The gas can then be used in a conventional power plant cycle to generate electricity or used with a storage system to be saved for on-demand electricity creation when the sunlight is not present. Conventional receiver designs typically feature tubes arranged in a cylinder or a flat panel of tubes. These designs can absorb about 80 to 90% of the concentrated sunlight directed at them when considering heat loss and reflections, but Ho said design enhancements to make the receivers even more efficient are required to help lower the cost of concentrating solar power and enhance scalability. When light is reflected off of a flat surface, it’s gone. On a flat receiver design, 5 percent or more of the concentrated sunlight reflects away. So we configured the panels of tubes in a radial or louvered pattern that traps the light at different scales. We wanted the light to reflect, and then reflect again toward the interior of the receiver and get absorbed, sort of like the walls of a sound-proof room. Earlier research on making solar receivers more efficient has concentrated on special coatings that are applied to the receiver. However, many of these coatings are vulnerable to breaking down over time, which decreases both the ability of the receiver to absorb sunlight and the possible lifetime of the solar receiver itself while increasing costs because of repair and reapplication. Sandia’s latest fractal-like receiver designs have improved solar absorption efficiency without requiring any special coatings. Ho and the research team created and tested numerous prototype fractal-like receiver designs scaled in size to work at small and medium-scale concentrating solar facilities and identified the designs that function best for each application. The team pioneered the use of an additive manufacturing method called powder-bed fusion to print their small-scale receiver designs from Iconel 718, a high-temperature nickel alloy. Ho said this novel printing method provided a cost-effective approach to test several fractal designs at a small scale and could be used in the future to print whole sections of larger solar receivers. Additive manufacturing enabled us to generate complex geometries for the receiver tubes in a small-scale prototype. Fabricating these complex geometries using traditional methods such as extrusion, casting or welding would have been difficult. The new designs function with conventional heat-transfer fluids for concentrating solar power, including steam and molten salts, but they can also apply other media for heat transfer and storage. Sandia is assessing the receivers’ performance with various gases by flowing air, helium and carbon dioxide through the receiver tubes with the crucial goal of pairing the new receiver designs with supercritical carbon dioxide Brayton cycles. The term “supercritical” defines the semi-liquid state of carbon dioxide when it is heated above its usual critical temperature and pressure. A Brayton cycle works by using the hot, pressurized supercritical carbon dioxide to spin a turbine, similar to a jet engine, which spins a generator for electricity production. Ho said both the U.S. and India are keen in pursuing supercritical carbon dioxide to create the next generation of concentrating solar power technology because it can realize better efficiencies with smaller footprints. The goal of concentrating solar power and SERIIUS is to develop efficient, cost-effective solar-driven electricity production with energy storage. The use of a solarized supercritical carbon-dioxide Brayton cycle would increase efficiencies, reduce space requirements and reduce costs associated with current large-scale concentrating solar power systems. The smaller footprint and cost would help enable the prospect of small-scale (in the 1-10 megawatt range) supercritical carbon dioxide Brayton cycle-based concentrating solar power facilities, enabling concentrating solar power to compete with other types of renewable energy.